Every year, thousands of pedestrians lose their lives when struck by vehicles on the Georgia roadways. As reported by the Centers for Disease Control, more than 5,000 pedestrians were killed nationwide in 2015. In addition, more than 120,000 received emergency medical treatment for their accident-related injuries. These victims are forced to endure severe physical harm, along with long-term emotional effects. Extensive medical treatment and the inability to function independently can lead to severe depression, along with feelings of hopelessness and isolation. Pedestrian accident victims may develop anxiety, with constant feelings of worry and trepidation. Some victims report fears about walking on the roadway or crossing streets at corners. Sleep difficulties. Psychological challenges can also lead to difficulties in sleeping patterns. The victim may be unable to sleep or may feel the need to only sleep, instead of handling daily responsibilities. Post-traumatic stress disorder. PTSD can manifest in different ways for different people. Some may experience all of the symptoms listed here, feel as though they are reliving the event (either in flashbacks or in real time), become more withdrawn or frightened of the world, or start exhibiting needlessly reckless behavior. These psychological challenges may require weeks, months, or even years of therapy and counseling. Victims may spend thousands of dollars to secure the assistance that they legitimately need. 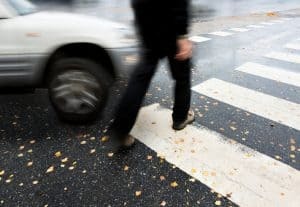 A civil case against those responsible for the pedestrian’s injuries can help to alleviate some of this financial burden. Who is at risk for pedestrian accidents? Older adults. Pedestrians aged 65 and older are most vulnerable for accidents, reportedly accounting for 19% of all fatalities and 13% of injuries. Of the individuals injured in pedestrian accidents, one in five are children under the age of 15 years old. People impaired by alcohol. Almost half of all pedestrian deaths involved an impaired driver or pedestrian. A third of these incidents involved alcohol impaired pedestrians and 15% of pedestrian accidents involved alcohol impaired drivers. If you were struck and injured by a vehicle, the car crash lawyers of Harris Lowry Manton LLP have the knowledge and experience to help you secure the compensation you need for your physical and psychological treatment needs. Our law firm handles personal injury matters on a contingency basis, so you do not have to worry about upfront costs. Call our Savannah office at 912.417.3774, our Atlanta office at 404-998-8847 or complete our contact form to schedule a free consultation.